I do believe that writing is art. Isn’t it wonderful that these great people think so too???!!! Inspiring …. 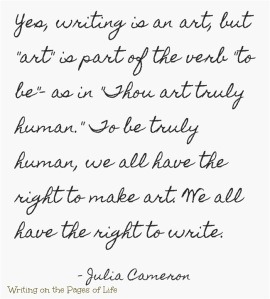 Writing is an art – I believe that too! A wonderful, wonderful art! All those quotes give me the gumption to keep at it! What a nice way to describe writers! Thank you Rosanna ~ I’m hoping to change the notion that writers are the bottom of the respect ladder in the Arts industry ! up. Do youu have any solutions to prevent hackers? Hi, I fortunately have not had any problems with hackers. Good luck with your blog and I hope you’ll be able to solve your problem with hackers.